A spotless, germ-free toilet reflects immaculate hygiene standards. But cleaning a toilet sounds unpleasant to most people. However, with the best toilet bowl cleaner, the task becomes fun and easy to accomplish. Most cleaners are ineffective and hazardous to your health and to the environment. You need a product with gentle yet effective ingredients. It should offer a good balance on the ability to kill bacteria, remove stains, and eliminate odors. We have a list of top-notch cleaners that will make your toilet bowl sparkle. What’s it that you want? Is it the best automatic toilet bowl cleaner, best gel cleaner, or the best toilet tank cleaner? This article covers various options to match your personal needs and lifestyle. For a bonus, we have a ‘safety guide and tips section’ to ensure you get the most out of your toilet cleaner. The more the benefits the better the Lysol Power & Freah toilet cleaner, right? This cleaner disinfects, sanitizes, and eliminates odors. 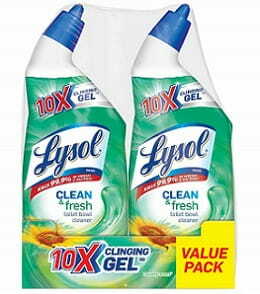 It’s a gel formula with 10 times clinging power, which is the best in Lysol’s line of toilet cleaners. The gel coats above and below the waterline for maximum coverage and a deep clean inside the bowl. Lysol power & fresh works fast to disinfect in at least 15 minutes. Sanitizing is super fast, just a mere 30 seconds. Once complete, the cleaner kills 99.9% of bacteria and viruses. It offers the unique benefit of a sparkling and fresh-smelling clean in ocean fresh scent. It has an angled bottle that targets difficult-to-reach areas, including under the rim. Thanks to its gentle ingredients, you can use this toilet cleaner with all septic and plumbing systems. It comes in 24oz bottles. A mere 4oz gets the job done, meaning one bottle lasts up to 6 washes. While there are a plethora of toilet gel formulas available, few can compare to the cleaning power and sanitizing strength of Lysol Ocean Fresh. It’s versatile, efficient and provides a thorough clean to eliminate smell, germs, and stains. How about a hygienic alternative to a germ-ridden toilet brush? 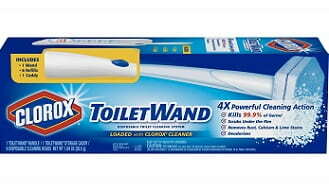 Clorox ToiletWand Disposable Toilet is hands-free, disposable toilet wand will suffice. It cleans deep and disinfects your toilet. Each head is pre-loaded with a powerful cleaning formula that removes stains and kills 99.9% of bacteria and viruses. The sponge provides a good scrubbing but remains gentle on the porcelain surface. It soaks up the water to avoid a drippy mess. The cleaning head combines a hexagon shape and a swivel design. It provides easy reach and covers every inch, including under the bowl rim for a deeper clean. The handle is long making it possible to clean from a distance. There are 6 disposable refills and a bonus of 3 to last up to 9 washes. A caddy provides convenient storage of unused refill heads. Using this toilet wand is a breeze. Just click on the refill head, swish to clean, and pop off. Clorox wand is an adaptable option for any toilet type. You can use the wand on any septic and plumbing systems. Dread the thought of touching toilet water and cleaning solutions? This all-in-one cleaning system is an excellent option for you. Cleaning with a conventional toilet brush can be a difficult undertaking. Few can debate the cleaning and disinfection power that comes with Clorox wand. This all-in-one wand is a must-have tool in the war against germs. Hard water buildup causes stubborn stains and rust. 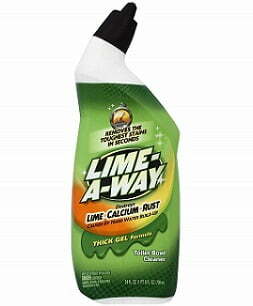 Lime-A-Way Liquid is professional strength cleaner removes rust, lime, and calcium stains. It has a thick formula that coats the bowel to remain in contact with stains for longer. The formula doesn’t dissolve, which makes it work above and below the waterline. It glides smoothly to cover all areas for a deeper, all-around clean. The gel works fast in just a matter of seconds. There’s no scrubbing, even for the toughest stains. Just give it a quick brush then flush for a complete toilet bowl clean. Though the formula works in an instance, you can give it some extra time. After all, it gives an invigorating aroma that lingers on for longer. The angled bottle gives easy time in hard-to-reach areas. Lime-A-Way is a remarkable toilet cleaner in the war against hard water deposits. It provides a deep, effective clean without the hassle of scrubbing. Indeed, it’s a vital contribution towards stain-free toilet bowls is impeccable. Lysol Power & Fresh cleaner creates sparkle and smells fresh in 3 scents. This particular cleaner produces a sweet country scent. It’s a toilet cleaner with multiple benefits. For instance, it disinfects and sanitizes to kill 99.9% germs. The sweet country scent makes it an excellent deodorant to leave your toilet smelling fresh. Gel formula with 10 times clinging power adheres to smooth porcelain and ceramic surfaces. It glides easily for maximum coverage and clings on for better contact with stains. The gel is thick and can work above and below the waterline without getting dilution. Awkward spots are within easy reach, thanks to the angled bottle. Every bowl ring is removed to leave your toilet spotless. There is no scrubbing after application. You just brush the entire bowl then flush. The cleaner works on all septic and plumbing systems. It’s in a value pack of two, 24oz bottles. Keeping a toilet clean and smelling fresh is a valid concern. Lysol Country Scent comes to your aid to maintain a clean and hygienic atmosphere. It tackles stains and microbes to leave your toilet clean and germ-free. Store-bought “green” toilet cleaners often cost more. However, their effectiveness and Eco-friendliness make an excellent trade-off. 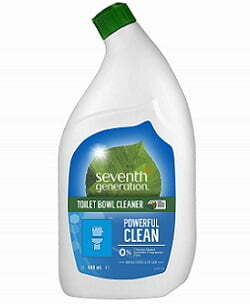 Seventh Generation cleaner disinfects and deodorizes without the harsh chemicals. It’s an Eco-package gentle on the environment yet tough on stains. The cleaner uses a biodegradable formula that’s doesn’t harm septic tanks. What’s more, it doesn’t clog up the plumbing system. The formula comprises emerald cypress and fir, a combination that keeps you safe from harsh fumes. Essentials oils and botanical extracts give a fresh scent. It doesn’t have the overpowering perfume-like smell. The bottle has an angled design that reaches below the toilet rim. A large 32oz capacity lasts a long while. Most cleaners contain harsh chemicals that give you a hard time to handle and mix. This natural toilet cleaner provides a safe, worry-free option. It uses gentle plant-based ingredients to maintain a clean, germ-free toilet. 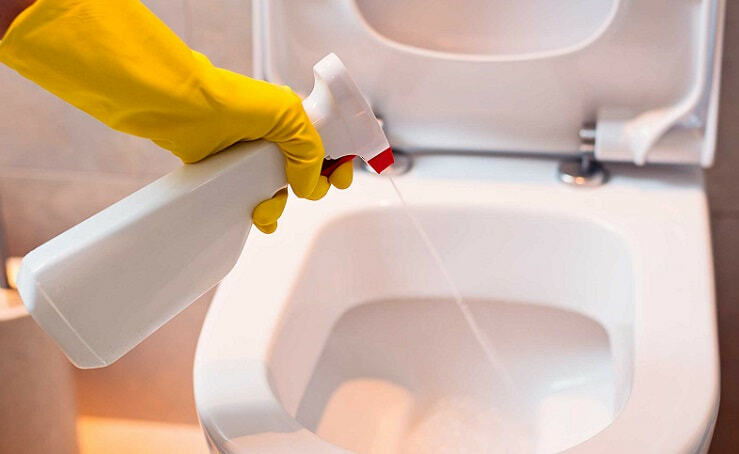 Here’s a more hygienic alternative to traditional clip-on toilet cleaners. It gives freshness with every flush to keep your toilet cleaner, for longer. This cleaner works to eliminate odors, lime scale, and toilet rings. You get a touch-free clean and a spotless toilet bowl. Like most toilet cleaners, it uses gel formula. This comes in the form of unique gel tabs. You use a dispenser to stamp inside the toilet bowl. The tap dissolves with every flush eliminating residue and offering a fresh “rain shower” scent. It’s a hands-free 24/7 cleaning system. Each tab lasts up to 7 days to provide a gradual yet deep clean. The time is much longer in case you use your toilet less frequently. It’s a scrubber itself, so you get to save your energy. There are 12 stamps in total enough to last a whopping 20 weeks. I call it the lazy housekeeper’s best friend. After all, you don’t put in an effort to get your toilet clean. Scrubbing Bubbles is a safe product for all septic systems. 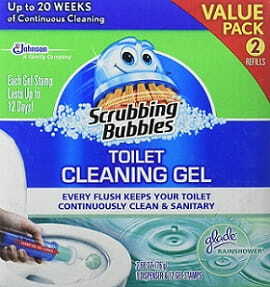 Scrubbing Bubbles automatically clean your toilet with every flush. It’s easy to install, effective, and gentle enough not to deteriorate the surface of your toilet bowl. You’ll love the hands-free deep clean and the scented freshness that keeps your toilet lively. 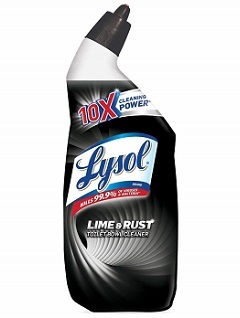 Whereas Lysol Power & Fresh gives you 10 times clinging gel, Lysol Lime & Rust provides 10 times cleaning power. It makes an excellent option where Lime-A-Way cleaner doesn’t appeal to you. This cleaner makes easy work of hard water stains. It conquers toughest toilet stains, including lime, rust, and mineral deposits. 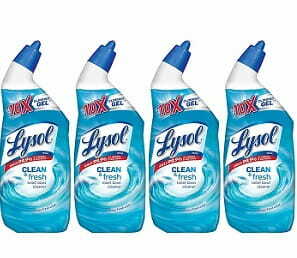 Lysol Lime doubles as a disinfectant to kill 99.9% of bacteria, viruses, and infections. A thick gel formula coats the bowl above and past the waterline for maximum coverage. Add that to an angled bottle, and you get every inch of the bowl coated. A few brushes followed by a flush leaves the toilet spotless clean. This cleaner works together with a deodorizer to provide a fresh smell. It uses ingredients gentle on vitreous China and porcelain surfaces. You just need ten minutes of waiting to let the cleaner do its work. This is a safe product for all plumbing and septic systems. Lysol Line & Rust is a no-mess cleaner that works neatly to clear hard water stains. It cleans in a way that provides a fresh feel and leaves the toilet free from microbial agents. It’s specially formulated to fight tough stains and remain safe on toilet parts. Looking for an affordable, scrub-free cleaner for toilet bowls? An automatic toilet bowl cleaner ought to be on your list. Clorox has this tablet version that sanitizes and deodorizes for months. Each tablet sanitizes in 5 minutes and lasts up to 2 months. In the process, it rids of up to 99.9% of germs. One tablet offers up to 3 months of cleaning and deodorization based on a count of 10 flushes per day. The long-lasting effectiveness reduces the number of deep cleans needed. This automatic cleaning system that requires a no-hands operation or any form of scrubbing. It does significantly more than just clean the toilet. For instance, it repels tough, hard water stains and mineral deposits. Unlike other toilet cleaners with bleach agent, it doesn’t produce an overpowering chlorine odor. In fact, it dispenses only a small amount with each flush. There’s a total of 8 tablets enough to last up to 2 years. Clorox bleach tablets don’t harm septic tanks. 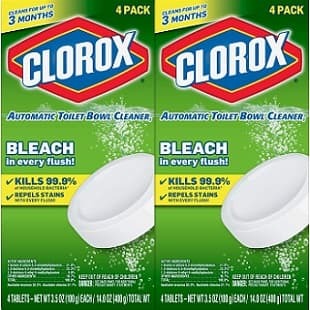 Clorox tablets provide a guaranteed stain-free toilet. It has 3 times the cleaning power of most products out there. With every flush, your mind will be filled with joy seeing a sparkling bowl in front of you. This scrub-free toilet clean system does away with every-day maintenance and handling of nasty chemicals. It’s a worry-free automatic cleaner that takes hard work from the task. 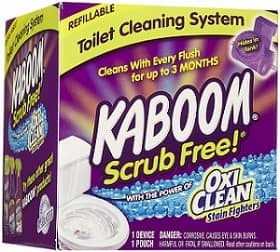 Kaboom is an in-line cleaner that connects to the water that flows directly into the toilet bowl. This helps keep tank components from damage. It uses a powerful, bleach-based formula that cleans and refreshes with every flush. The system uses a refillable cartridge, which provides up to 3 months of continuous cleaning. Most in-line cleaners last 1-2 months. With the long lifetime of this cleaner, you get to extend the time needed for refills, hence less cost. Installing the system is a breeze. It just snaps in the tank with no tools required. This automatic toilet cleaner stays completely out of view for a clean look. If toilet stamps and tablets don’t impress you, this in-line cleaner will. It provides the major convenience of automatic cleaning. The cleaner lasts longer to power you through months of continuous cleaning. 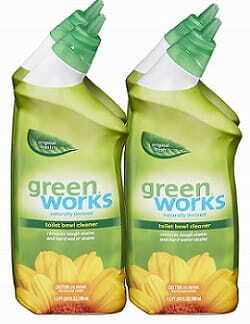 Green Works toilet cleaner falls under the Eco options. It delivers a powerful clean using safe, natural ingredients. Most “green” cleaners out there comprise 95% active ingredients. Green Works goes a step further to provide 99% active ingredients. It’s more thorough and works better than most conventional toilet cleaners. This cleaner removes hard water stains, rust, and mineral deposits. Plant-based ingredients make it safe for those suffering from allergies. It doesn’t produce harsh fumes or chemicals. In fact, it’s safe for use in homes with pets. Green Works cleaner is an easy-to-apply gel formula. Synthetic fragrances let it double as a deodorizer to give a fresh scent. Everything in this toilet bowl cleaner is environmentally-friendly, including the recyclable bottle. The bottle has an angled design for better reach, especially under the rim. This cleaner is gentle on most surfaces. A bleach-free formula makes it safe for septic systems. Green Works is a remarkable environmentally-friendly alternative to conventional cleaners. It keeps your toilet clean, fresh and eliminates the risk of ecological hazards. It’s among the safest options for family and is guaranteed to perform optimally. Get all the necessary materials together to save time. Must-have materials include gloves, eye protection, toilet bowl cleaner, toilet brush, disinfectant spray, among others. Begin the cleaning process. The best rule of the thumb is to start with the bowl. Stick or apply a generous amount of toilet cleaner under the rim and let it soak as directed to loosen dirt and stains. Clean the outside of the bowl in case you have a raised toilet. Use a disinfectant spray for this task. Start from the tank to the bottom. Scrub to make it spotlessly clean. Wash away the disinfectant using a sponge and hot water. Proceed to clean the inside of the bowl starting with the rim. Put more focus under the rim and scrub with a toilet brush to loosen or reveal hidden dirt. Add elbow grease and disinfectant for a thorough clean. Flush the toilet until the bowl is clean. Make a final rinse with mild detergent to leave the toilet bowl spotlessly clean. Choosing the right toilet bowl cleaner is no easy task. There’s a multitude of options out there, which in most cases can leave you confused. You can read the following few pointers to help you make an informed choice. Spray cleaners are quick to apply, but the coverage area is less. Angled squirt bottles give you better coverage, even in tight spots. Tablets, especially those left in tanks provide full coverage and automatic cleaning. However, most often contain chemicals that can damage tank components. Gels, in most cases, are better off maintaining hygiene rather than doing actual cleaning. But with additional scrubbing, gels can handle tough stains with ease. Most cleaners contain toxic contents that can cause allergies and other diseases. Product ingredient disclosure has become a requirement. Try to find out on the label to ensure you’re safe. Some chemicals, when used in large amounts, might be hazardous to the environment. Check for a product that doesn’t pose ecological risks. Consider toilet cleaners that contain natural ingredients. Alternatively, you can settle for cleaners that are safe for septic and plumbing systems. A healthy environment starts with proper waste management. Consider a toilet cleaner with a recyclable package. This will reduce the amount of waste on the environment. Another solution is to choose a product with effective, long-lasting cleaning power. This will extend the time between cleans and reduce the waste created by consuming the product. Is there a possibility that the cleaner you use can trigger the allergy? Some cleaning products contain harsh ingredients, which can be a problem for those who are sensitive to chemicals. Choose a product that isn’t irritating to any of the household members. Cleaning a toilet bowl becomes easy when you have a good strategy and the right products. The above mentioned are the best toilet bowl cleaners specially formulated to give the best results and save time. Remember, the effectiveness of a toilet bowl cleaner increases when used the right way. From the list, we have provided different options targeted at various types of stains and lifestyles. Which toilet bowl cleaner appeals to you most? The best way to find out is to buy one or two and put them to use. Remember, the toilet is part of everyday life and ought to be kept spotlessly clean. Had any experience using one of the toilet bowl cleaners? Please, share with us in the comments section.